Little Bit of History: From Domark and relased in 1985 for the Commodore 64. 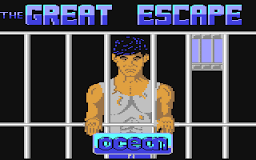 Later ported to the Amstrad CPC and ZX Spectrum. The game was inspired by the film series of the same name and became infamous for its jump scares. Some copies of the game even came with fake blood capsules filled with red sugar water that you could use to make it look like blood was pouring from your mouth. Also at the end of the tape was a collection of horror SFX. Little Bit of Plot/Story: You play as one of the teenagers and are tasked with hunting down and killing Jason Voorhees while trying to protect your friends by taking them to a player selected sanctuary somewhere on the map. Jason could disguise himself as anyone of your friends and this would make him hard to find. Little Bit of Character: You could play as 1 of 5 teenagers including; Gerry King, Bryan Bone, Amanda Baxter, Wendy Watson and Stuart Palmer. Then of course there was also Jason Voorhees. Little Bit of Influence: Later Friday The 13th games were made like the more known one for the NES another for mobile games in 2000 and there is an all new Friday The 13th game coming to PC, Xbox One and PS4 to be relased in autumn of 2016. Little Bit of Memories: I had this one on the same compilation tape as The Evil Dead. I always remember this one being pretty good fun even if it did have a strange soundtrack like Teddy Bears Picnic would play if you went to the woods or Old McDonald when you went to the farm. The map at the time was quite varied and fun to explore all while trying to find Jason. Oh and then there were those jump scares I mentioned as if/when Jason would kill one of your friends, you would be greeted with a image of a teenager with a machete stuck in their head and a loud digitized scream sound. Little Bit of Playability: I was quite surprised to find this was still pretty playable today. I really enjoyed exploring the map and trying to track down Jason before he killed everyone. Though the controls did feel a little stiff, but after a while I got used to them. Still a pretty fun game to play today. This entry was posted in LBoG: Game Overviews and tagged c64, commodore 64, Friday The 13th, LBoG: Game Overviews, Little bits of gaming, The Evil Dead on 13/11/2015 by Steve Perrin. Little Bit of History: Written by Andrew Braybrook, developed by Graftgold and published by Hewson Consultants. 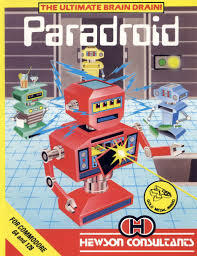 Released in 1985, Paradroid was a very “unusual” but original game for it’s time. A meeting of shoot em’ up and strategy in a Sci-Fi scenario. Little Bit of Plot/Story: Set on a spaceship overrun with droids, you control a special droid called the “Influence Device” and you must destroy all other droids on the ship. Starting with the low droid number of 001, you can destroy or even take over the other droids. Each droid has it’s own number with higher numbers meaning stronger more difficult droids you can become. Little Bit of Character: There are no real characters, just hundreds of differing and numbered droids. Little Bit of Influence: There are plenty of similar styled games available on IOS and Android. Paradroid also spawned variations and different ports on the game like: Paradroid Competition Edition, Heavy Metal Paradroid, Paradroid 90 and Paradroid 2000. Along with several fan made remakes and updates. The original Paradroid on the Commodore 64 is often hailed as one of the best and most original games on the system. Little Bit of Memories: I have very fond memories of this game as it was something very different for the time. Picking and choosing which droid you should attempt to destroy or take over, having to think before you acted really offered a refreshing change and something original to enjoy. Little Bit of Playability: It’s a bit clunky and sluggish by today’s standards and some of the other versions and even fan made remakes play smoother. But at it’s core is still a great action/strategic game worth revisiting in any of it’s versions. This entry was posted in LBoG: Game Overviews and tagged c64, Game retrospectives, game reviews, Little bits of gaming, Paradroid, retro gaming, Retro gaming blog on 12/05/2015 by Steve Perrin. Listed in the Guinness Book of World Records as the highest-selling single computer model of all time. The Commodore 64 was our first ever home computer. Originally released in 1982 and discontinued in 1994, the Commodore 64 was one of the world’s most popular home computers outselling its main competitors like the Atari 8-bit family computers, the IBM PC, ZX Spectrum, Apple Inc. computers and Amstrad computers. The Commodore 64 was a very versatile little machine. Whether you wanted to use it of bussines, school work or just gaming. This little machine could do anything you wanted/needed it to, which was in part why it was so popular. It was easy to use and covered anything you needed doing…though we only used it for games. Whether you favoured the C64 tape deck, the floppy disk drive or even the cartridge format. The Commodore 64 had you covered as it could utilize all of them and provide you with a vast and varied gaming catalogue. With great games like; Delta, Elite, The Last Ninja, Wizball, Impossible Mission and even some great acrade ports; Outrun, Gauntlet I & II, Spy Hunter, Yie Ar Kung Fu, Mr. Do’s Castle…it even had a port of Street Fighter II. The Commodore 64 had an entire “family” of various versions. Like the Commodore SX-64 which was a portable, version of the original Commodore 64 and even holds the distinction of being the very first full colour portable computer. There was also a Commodore MAX machine sold exclusively in Japan as more of a game console with limited computing capability. The Educator 64 was created to be sold to schools and cut back on graphical capabilities so as to concentrate more on the educational aspects of the machine. There was even Commodore 64 clones made in 2004 from manufacturer: Tulip Computers who became owners of the Commodore brand in 1997. Tulip Computers produced the C64 Direct-to-TV. Which was essentially a Commodore 64 computer, contained in a joystick which was modeled after the Competition Pro joystick and came with 30 built-in games. Also in 1998 saw the release of the C64 branded; Web.it Internet Computer. This was a low-powered, Internet-oriented, all-in-one x86 PC running Windows 3.1. Even as recent as 2011, PC clones branded as C64x were being sold by a company licensing the Commodore trademark, Commodore USA. The Nintendo Wii had several Commodore 64 games released via the Wii’s Virtual Console service in Europe and North America. However, the games were removed from the Virtual Console service in 2013 for unknown reasons. The Commodore 64 was a well celebrated and long remembered computer for a very good reason. My first ever memory of the Commodore 64? One Christmas Eve night in the early-mid 80s, my Mom had to go into work and left me and my two older brothers at home. So we did what anyone else would do…we took a peek at one of our presents. Slowly, carefully peeling of the sellotape and delicately opening the wrapping paper being careful as not to tear it. The ex-neatly wrapped present revealed a shiny new Commodore 64 and a copy of Gauntlet. Tentatively the box was opened and quickly the Commodore 64 was set up and loading Gauntlet. After playing for a while, the Commodore 64 was just as quickly dismantled, reboxed and meticulously rewrapped then placed back under the tree all set for the “surprise” on Christmas morning. This entry was posted in LBoG: Editorials and tagged c64, commodore 64, Game retrospectives, Little bits of gaming, retro gaming, Retro gaming blog on 29/04/2015 by Steve Perrin. Little Bit of History: This title has a very interesting history. In 1987, German developers Time Warp Productions wanted to port Nintendo’s Super Mario Brothers to the Commodore 64. Nintendo would not allow other platforms to use their Mario IP. So Time Warp Productions went on and made the game anyway but changed the main characters. The game was withdrawn from shops by publisher Rainbow Arts at Nintendo’s request, making a boxed copy of the game rare today. Little Bit of Plot/Story: You play as Giana, who suffers from a nightmare in which she travels through 32 dungeons full of monsters. Collecting ominous diamonds and looking for her sister Maria. If the player completes all 32 dungeons, Giana will be woken from her nightmare by her sister. Little Bit of Character: Single player has you playing as Giana, whereas an alternating 2 players option as the second player taking control of Maria. Enemies are not named, but consisted of: owls, deadly insects, flesh eating fish and rolling eyeballs. Little Bit of Influence: This game did spawn an official sequel called: Hard N’ Heavy, but it was altered to avoid further legal issues with Nintendo. 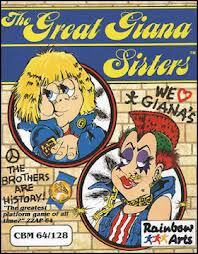 There was even an unofficial sequel called: Giana Sisters II which was a hack of the original. But ironically, despite Nintendo’s disapprovement of the blatant ripping off of their IP Super Mario with the original game. Subsequent official sequels were made like: Giana Sisters DS and Giana Sisters: Twisted Dreams both released on Nintendo’s handheld DS system. Little Bit of Memories: Not having a NES growing up (but a friend did) meant I did not get chance to play Super Mario Brothers that often. So having our very own version, even if it was a rip off, was a welcome addition. I also remember the controversy the game created and it’s removal from sale. Little Bit of Playability: If you enjoy playing Super Mario Brothers today then you’ll enjoy this game too. It retains that classic Mario style but also does things just a little bit differently to keep you entertained. This entry was posted in LBoG: Game Overviews and tagged c64, game reviews, Great Giana Sisters, Little bits of gaming, retro gaming, Retro gaming blog on 29/04/2015 by Steve Perrin. 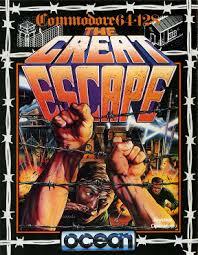 Little Bit of History: Developed and published by System 3 and originally released in 1987 for the Commodore 64. Then ported to other platforms like; MS-DOS, BBC Micro, Apple II, Amiga, Atari ST and even a ZX Spectrum port. The game was a masterclass of melding fighting, puzzles and exploration. 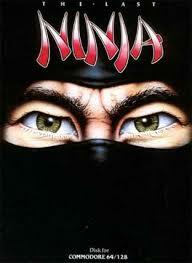 The Last Ninja was universally critically acclaimed as an original, ground-breaking game and won many gaming awards at the time. Little Bit of Plot/Story: You are the last living member of your ninja clan after they were brutally slaughtered by shogun Kunitoki. You play as the “last ninja” protagonist; Armakuni on a journey to the palace of the evil shogun; Kunitoki to assassinate him and avenge your clan. Little Bit of Character: Aside from your character, Armakuni and the main villain, shogun Kunitoki. All the other characters were unnamed enemies. Little Bit of Influence: The game spawned 2 sequels and even an abandoned 4th game was in development. An updated version was planned for the PS2, Xbox and Gamecube but ultimately cancelled too. There have even been fan-made remakes. Influences can be seen in many modern games action/adventure games and even Ninja based games like the Tenchu series. Little Bit of Memories: I always remember my older brother kept saying how much he wanted this game at the time. That cover still sparks off memories and is one of the iconic game covers ever (see below), plus the music still plays in my head. I also remember that while the game played like a dream for the most part, that I hated those tricky jumps over rivers by having to use really small stones and the clunky jumping mechanic didn’t help. Little Bit of Playability: Once I got used to the rather cumbersome controls as turning around was always a chore. 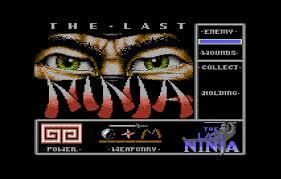 The Last Ninja was still a very playable title today. The combat works and was very advanced for the time with the fact you can target separate body parts. Exploring the levels I vaguely remembered trying to find the weapons, etc. I’d recommend the game today, but those controls can be awkward. This entry was posted in LBoG: Game Overviews and tagged c64, game reviews, Little bits of gaming, retro gaming, Retro gaming blog, The Last Ninja on 29/04/2015 by Steve Perrin. Little Bit of History: This game was designed by David Crane and Rich Gold, published by Activision and originally released in 1985 for the Commodore 64, ZX Spectrum and Amstrad CPC with several other ports on other machines coming later in 1987. The game manual made out that little computer people were “real” and did live inside your computer. Little Bit of Plot/Story: There was no “goal” to achieve. You just interacted with your little computer person in their house in various ways in their daily life from simple day to day tasks like reading a newspaper, watching TV, etc to playing poker with you the player. All via simple commands you would input. Little Bit of Character: There were no characters to speak of really other then your own little computer person that would be randomly generated each time you loaded up the game. 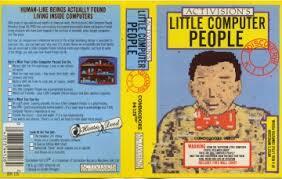 Little Bit of Influence: The game was most definitely the forerunner for games like The Sims and other life sims of today, in fact Will Wright (creator of The Sims) as said that he used to play Little Computer People and even had one of the game’s designers, Rich Gold offer feedback when he was developing The Sims. Little Bit of Memories: I recall never really playing anything like this before. There was not real “game” here but it was still massively absorbing and fun to interact with your little computer person. Each time finding a new interaction or animation. Little Bit of Playability: While not as deep of innovative as todays life sim games, I still found this great fun to play and waste time on. It’s minimalistic, but still enjoyable. 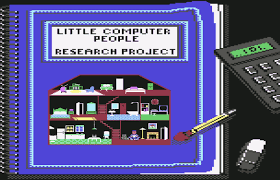 This entry was posted in LBoG: Game Overviews and tagged c64, game reviews, Little bits of gaming, Little computer people, retro gaming, Retro gaming blog on 16/04/2015 by Steve Perrin.